It is no secret that I am personally pro-life. Lt. Gov. Byron Mallott is pro-choice. When we embarked together on the Unity Ticket in 2014, we made it clear that we would put aside partisan agendas and focus on practical solutions to the challenges that Alaskans share. And we have done that. At every level, our administration is built around the idea that leaders with different beliefs can come together and put Alaskans first, above personal politics. That's why we fought through legislative gridlock to expand Medicaid, extending access to health care and affordable birth control to more than 40,000 Alaskans. That's why we worked around the clock alongside Sen. Lisa Murkowski to protect Alaskans' access to health care at the federal level. And that's why we partnered with a bipartisan group of governors to introduce a blueprint for national health care reform. We're proud of that hard work – not only because it's good for Alaska, but because it supports our shared goal of reducing unwanted pregnancies among Alaskan women. For me, being pro-life is much more than being "anti-abortion." It means supporting access to contraception, health care, economic opportunities and reducing crime against women so that fewer women are faced with this decision. It also means supporting Alaska's children, which we have done by forward-funding education and opposing school vouchers, in addition to Medicaid expansion. Going forward, we look to legislation that would make birth control available on a 12-month basis, rather than require repetitive and unnecessary trips to the pharmacy. And, we are ready to leverage our now stable fiscal outlook to launch a comprehensive attack on health care costs in our state. As the U.S. Senate considers a new Supreme Court nominee, we've heard from many people who are concerned. Some are afraid that a woman's access to health care is under threat through the repeal of the Affordable Care Act, Medicaid Expansion, and Roe v. Wade. While we can't control what will happen at the national level, we are committed to upholding the Alaska Constitution. The Alaska Constitution is one of very few state constitutions with an explicit privacy clause—something the U.S. Constitution lacks. This clause reads: "The right of the people to privacy is recognized and shall not be abridged." The Alaska Supreme Court has recognized that this right to privacy is broader and stronger than its federal counterpart. In short, if legislation were proposed denying or abridging an Alaska woman's current right to make her own reproductive choices, such legislation would violate Alaskans' right to privacy. Just as we committed in 2014, Byron and I will not support legislation that unconstitutionally impacts a woman's right to make her own health care decisions. This is not a statement I make lightly, for I do hold dearly my personal beliefs. However, when I became governor, I swore an oath to uphold the Alaska Constitution, and that is an oath I hold sacred. That is the duty I owe to Alaskans and it comes before my own personal beliefs. But in answer to those Alaskans who are concerned, let us be clear. Regardless of who is appointed to the U.S. Supreme Court, Alaskans will continue to be protected by a broader right to privacy in this state. As governor and lieutenant governor, we have sworn an oath to uphold the Constitution and laws of this state. Therefore, a woman's constitutional right to choose will not be infringed upon or reduced under the Walker-Mallott administration. Should any legislation pass impinging that constitutional right held by Alaskans, I will honor my oath and veto it. 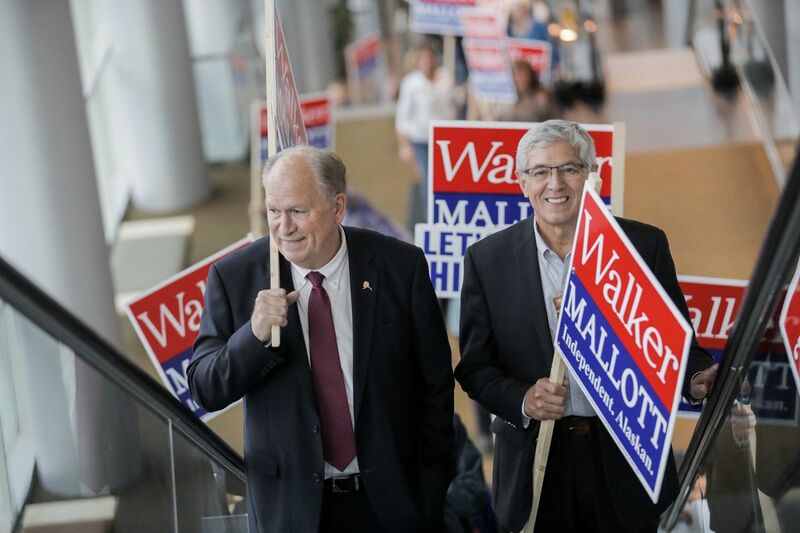 Bill Walker, running for re-election as an independent, is the 11th governor of the state of Alaska.